A couple of weeks ago I made this casserole and I was a little worried because it seemed to saucy, not enough substance but my husband loved it! Ease: 5/5. Throw everything into the crockpot and let cook. Changes: I did not use the sweet potato, parsley and the chicken seasonings. I used my own seasonings. I didn’t mean for my Trunk Club and Stitch Fix to come back to back but they did and I just have to deal with it. Also, my photographer is getting worse and worse. It is like he does not even care about these little fashion shows while he is trying to watch his show. Anyway.. Sent back. This top did nothing for my figure. The top itself was pretty shirt and since the “tutu” was sheer, it would not have been pretty. Plus the arm holes were a little big. Return. This top is weird. It has a cream thermal shirt in front and sheer polka dots in the back. I do not think it went well together. It was also short. I have had this shirt on my pinterest board for months. In fact, I had this one and a gray one. I actually wanted this one more. When I saw I got it, I did a happy little dance and just hoped it would not let me down. After trying it on, it is definitely a keeper! Nice fit and nice length. Keeper! I did not want to take this dress off. It is so soft and comfy. I can wear this to work with leggings or out and about. I just wish my city had a few more cold days so I can wear it all the time. This necklace screams me, simple and silver toned. However, I returned it because I couldn’t figure out how to wear it. It has the feather but also another chain. Since I couldn’t figure it out, I sent it back. 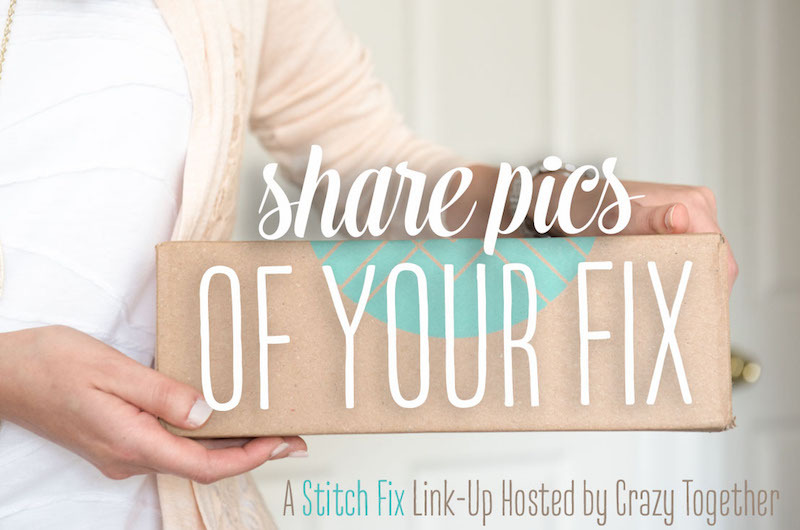 If you are interested in trying Stitch Fix, go right here. Also, want to see what other people got, go here. A couple of weeks ago I made this dish for my husband. He was a little afraid because every time he has prepared quinoa, it came out soggy. He was pleasantly surprised by this dish. Ease: 4/5. The hardest part was to get the sausage to crumble as we used sausage and not ground sausage. Changes: We did not use olives as my husband does not like them. We also didn’t add spinach, but can’t remember why. This week I got my 2nd Trunk Club. I do these(or want to) every 6 months. My husband also gets Trunks but keeps more than I do since I also do Stitch Fix. His last Trunk, he kept like 2 pairs of pants, a shirt and jacket. Please ignore the fact that my hair is wet, I just showered after a brutal Crossfit workout. Also, one of the pics is very blurry because my husband was trying to watch something on his tablet and was not amused. I returned both. The shirt was too big and too short at the same time. The pants did not fit like skinny jeans. These were both a big no. I kept the pants. They fit perfectly and I could use a new pair of black pants. I loved the sweater, I really did and has very pretty details. I wish I had a upclose photo. Unfortunately, it had a warning saying do not wear jewelry with it because it is so delicate. If it will be ruined by that, I do not want to know what a toddler will do to it. Free People Allure Pullover in ivory($73.50) and same black pants. No to the top. It looks so weird on me. I felt like I was Beethoven. Plus, it kept falling down more and becoming obscene. Vince Camuto Rib Trim High/Low Blouse ($79) and same black pants. The shirt fit fine. I just did not like the fabric. I am weird on fabrics and how they feel on the skin.So this was a no. Free People Rising Sun Tee in blue ($43.50) and same black pants. I felt like a hippy in this shirt so I kept it. Not because of the hippy feel. It was soft and long in the back where I could wear leggings (yes I am one of those moms). I debated back and forth between this shirt and the next sweater. However, the shirt one because it was cheaper. We have had a lot of unplanned circumstances come up in the last week. Trouve Corrugated Stitch Pullover in Tidepool ($79) and same black pants. So I liked this sweater when I pulled it out, and then hated it on. Then I looked at this picture and liked it again. I debated and debated but the shirt will get more use from me. Want to give my stylists a try? Her name is Nicole and she is awesome. You can go here. On January 15th, I ran my 12th marathon which was the 7th year in a row I ran the Houston Marathon. This year was a killer for me. I had gone into training season rethinking my training plan. My 2 best marathons (in terms of how I felt) were marathons where I never ran a distance longer than 18 miles. In fact, my fastest marathon was one where I never trained over 13 miles and I was severely injured at the start (injury had nothing to do with running). So I was only going to go up to 16-18 miles and call that my training. However, I did for a 20 miler and a 21 miler with a friend because she likes to do longer runs to train and I like to run with my friends. My 20 miler felt great. It was in the mid 50s and raining on and off. My 21 miler felt horrible. It was actually suppose to be 22 but it was so hot and humid that day. I do not do well in the heat. The week before the marathon, I caught a bug that went through my household. Basically, I had no fluids/foods in my stomach for a couple days. So I was going into the marathon already dehydrated. The week before also had fluke weather in the 20s. Too bad it was in the 70s a couple days later. I can rock 20 degree running weather. I cannot rock 70 degrees. Friday: I worked. My friends and I always do a carb loading dinner that night. It is always a lot of fun and it is a girls only event. Saturday: My family headed to the expo bright and early to get in right when it opens. Unfortunately, we had a to wait because they were not ready yet. I knew I only had a certain window to get my bib and shop because of my sons swim lessons at 11. We got in, got my bib and shirt. Then we walked around and shopped and had photo ops. Now, there are a couple shops at the Expo I always go to. I love going to the Sweaty Band booth because they always bring some headbands that are on sale and those are my favorite headbands. I also like to see the official merchandise. I bought a shirt this year. My son started to throw a fit so we couldn’t shop around too much. We did have to wait a little bit for my friend who works for the marathon and gives me a special pass to use real restrooms the morning of the race. Sunday: Race Day. It was going to be in the 70s the whole race at like 98% humidity. That means I was preparing for the worst.We get to the race super early to hand in my bag, see my friends, photos and so on. My husband and son left as they were on the course in 5 different places. I started with 3 friends but 2 of them were running the half marathon so they left us right after the start line. I ran with my other friend for the first 15 miles. She wanted to keep running with me but I was hitting a wall and mentally wasn’t there. She also felt great and I didn’t want to stand in her way. Mile 15. The smile is fake, I was not in a good place. So after much convincing, my friend took off running and I slowly faded. I had a huge cryfest when I saw my husband and son at mile 15.5 and complained how awful I felt. I said I was dizzy and just felt horrible. Medics overheard me and followed me to the next aid station. They kept asking if I wanted to quit, which will always be a no from me. So I ran and then would walk when needed. I also put on my music and would run a song and walk a song. That method worked great until my music died (I only run with music during races or when I run by myself so I probably had not charged it in months). I also had another cryfest at mile 20 but no family was there. A nice spectator did hand me a diet Pepsi though. One thing I do that helps is I have a list, which you can see the white paper on the picture above, of people/things I am dedicating my miles too. So when I feel real bad, I just remind myself of who I am running for. By the time I got to mile 24, I felt great but I was walking a bit when my friend saw me. We talked for a bit since I was not worried about my time. I even stopped and got a free pair of sunglasses that were being handed out. I never run my marathons as a race because I am not going to win. So I try to have fun. When I finished, I ran into some friends and one was so worried about me because when she saw me at mile 18, I looked sickly. We got our shirts, beer mug and our bags and stopped by the food court for some chocolate milk (my favorite). I was also lucky enough to see one of my former students who was volunteering in the food court. Afterwards, I went to the reunion area to find my family. My husband always has cupcakes from Crave Cupcakes for when I finish. This marathon was mentally tough for me and my body was probably not ready for it after being sick (beer did not even taste good while running which is weird). However, I finished and I wasn’t that sore afterwards. I ran that Tuesday and went back to Crossfit on Wednesday. Now I just need to plan my race calendar for the rest of the year.